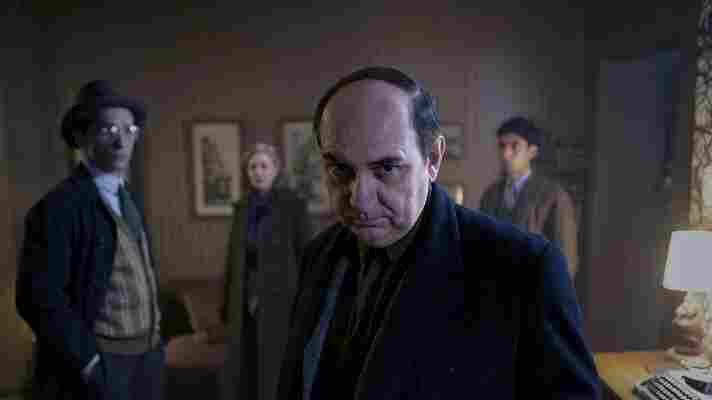 'Neruda' Affectionately Dismantles The Myth Surrounding The Chilean Poet Director Pablo Larrain digs beneath the poetry to offer a warm, humorous and revealing biopic of Pablo Neruda, neatly avoiding the genre's tendency to lionize its subjects. Luis Gnecco as Pablo Neruda in Pablo Larrain's Neruda. If Pablo Larrain is news to you, he won't be for long. The Chilean director, whose Tony Manero, No, and The Club won critical praise but only modest box office here, has two highly recommended new films in the awards spotlight this year. Like Jackie — a challenging and brilliant portrait of Jackie Kennedy in the aftermath of her husband's assassination — Larrain's Neruda engages in iconoclastic play with clichés that have clung to a national legend, in this case Chile's beloved poet-politician Pablo Neruda. Neruda is warmer, funnier, more accessible and more willing to entertain than Jackie, in part because it's only a nominal bio-pic that comes cunningly wrapped in genre packaging. Expect no saints or blemish-free heroes; the story is narrated by a fascist cop, and he's not the only one crafting a grandiose self-image here. The movie begins with Neruda at the height of his populist appeal even as the Communist Senator is impeached and about to flee the wrath of Chile's rising dictatorship three years after the end of World War II. Framed as a detective road picture, Neruda is a fanciful unpacking that works in the flawed spaces separating Neruda the hero, the artist, and the man. As played by Luis Gnecco, he's a long way from the rosy look-in Neruda got in the saccharine 1995 movie The Postman (Il Postino). Paunchy and balding with a bad comb-over and a disconcerting Cabbage Patch doll face, Gnecco's Neruda is nobody's idea of a pin-up, still less a literary lion. Yet women — from hotel maids to the hookers he cavorts naked with on unauthorized jaunts away from his various hideaways, to his wives past and present — go mad for him. And he for them, though his treatment of women, to say nothing of the workers and leftist politicians and intellectuals who faithfully abet his efforts to escape the authorities, careens between loving, evasive, and downright cruel. The son of a railwayman and a dedicated champagne Communist who hangs out with bohemians and intellectuals, Neruda is a political animal who fairly bursts with contradictions that Larrain delights in playing off one another. Like many men of The People, this Neruda falls short when he's around actual flesh and blood. Larrain has us rooting for Neruda's second wife, Delia (Mercedes Moran), a cultivated and preternaturally loyal painter, only to have him turn away from her when necessity or need arise. Sensitive and generous with impoverished strangers, he routinely places his handlers in danger by wandering off from the safe houses they risk their lives to secure for him. Neruda really did go on the run, fleeing across the Andes to Argentina while writing and circulating his famous cycle of poems, "Canto General." He also read crime novels to while away the tedium of a life in hiding, and Larrain has given him a delicious, fictionalized nemesis in the form of an openly corrupt policeman, played by Gael Garcia Bernal in a dopey fedora and pencil mustache. His Oscar Peluchonneau fancies himself both a great cop — he models himself on Chile's notorious Chief of Police — and a great artist like Neruda. He both loathes and over-identifies with the man he's tasked with taking down, and who keeps setting traps for him. He is, of course, Neruda's creation, and together, as it grows unclear who is writing whom, they carry the tone into farce. For all its jokey impudence, though, Neruda takes deadly aim at Chile's flowering dictatorship. Peluchonneau is as sinister as he is ridiculous, and Augusto Pinochet, who would later become Chile's President until his overthrow in 1981, pops up as a vicious prison commander, rounding up workers and dissidents with gusto. As in all his movies, Larrain is an expert juggler of tones: by turns antic and lyrical, Neruda is shot with a dark, nocturnal beauty and a mournful orchestral score. As the left-wing son of right-wing parents, Larrain is no stranger to irony or complexity. Neruda doesn't merely unpacks the idea of the hero as saint; it dismisses the whole notion of an integrated personality. (Jackie, too, grasps Kennedy's widow as a woman of steel determined to preserve the whole Camelot flimflam in the midst of her grief.) Yet if Larrain never saw a facile myth he didn't love to dismantle, he's no cynic either in this tough, tender portrait of a man, at once an opportunist and an idealist, with Chile's best and worst selves duking it out inside and around him.